The SpringStar Mosquito Trap-N-Kill® product can be used as part of an effective mosquito control program against mosquitoes that can carry diseases such as dengue, chikungunya, West Nile virus, and yellow fever. 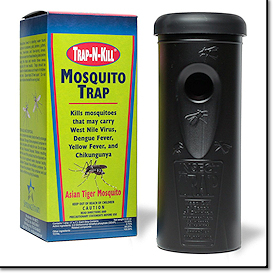 The Mosquito Trap-N-Kill® is a simple black container that mimics the breeding sites for the Aedes mosquito species, and kills females when they enter the trap to lay their eggs. It is easy to assemble, and can provide a low-cost, low-pesticide alternative to fogging practices. Similar lethal ovitrap technologies have been effectively used in Queensland, Australia and the Philippines as part of their dengue control programs. Female mosquitoes recognize this as a site to lay their eggs. Mosquitoes entering the trap will be killed or die shortly thereafter. Mosquitoes breed in standing water found outdoors in containers, pots, planters, gutters, tires, tree-holes, and low-laying areas regularly for best results. Traps should be placed in shaded areas out of reach of children and pets. Space traps 25 feet apart. Do not use on tables intended for serving food. Open canister and take out packet containing pesticide strip, red velour landing strip, and black zip nylon cable tie. Open the enclosed packet and take out pesticide strip. 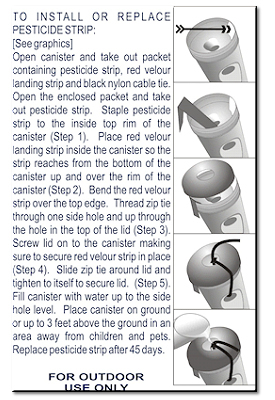 Staple pesticide strip to the inside top rim of the canister. Place red velour landing strip inside the canister so the strip reaches from the bottom of the canister up and over the rim of the canister. Bend the red velour strip over the top edge. Thread zip tie through one side hole and up through the hole in the top of the lid. Screw lid onto the canister making sure to secure red velour strip in place. Slide zip tie around lid and tighten to itself to secure lid. Fill canister with water up to the side hole level. Place canister on ground or up to 3 feet above the ground in an area away from children and pets. *Replace pesticide strip after 45 days. Check water level weekly, fill to the bottom of the drain hole as necessary. Replace the pesticide tab and velour strip every 10 weeks. We recommend 4-6 traps per small lot and up to 30 traps per acre outside of inhabited buildings. Don't worry if you don't see dead mosquitoes in the trap. The mosquitoes die within minutes of exposure to the pesticide, and many die after they've left the trap. When replacing the pesticide tab and velour strip, check the velour strip for eggs. Mosquito eggs are black, oval shaped, and about the size of poppy seeds. Not every trap may contain eggs or mosquitoes every time you check it. If you see larvae (wrigglers) moving, replace the pesticide tab. The trap is working as long as you have water in the trap, the velour strip is in place, and the pesticide tab is replaced at least every 10 weeks or sooner if live larvae (wrigglers) are seen. Mosquito Trap - fights West Nile Virus and Avian Pox by trapping the egg laden females preventing them from biting and infecting your birds.